Mac and cheese, an American classic that even though having been re-invented many times over by pretty much every professional chef and home cook out there, somehow retains its iconic comfort food status. The great thing (and what I think is its secret) about making macaroni and cheese is that it can take on so many different flavor variations depending on the types and combination of cheeses used. 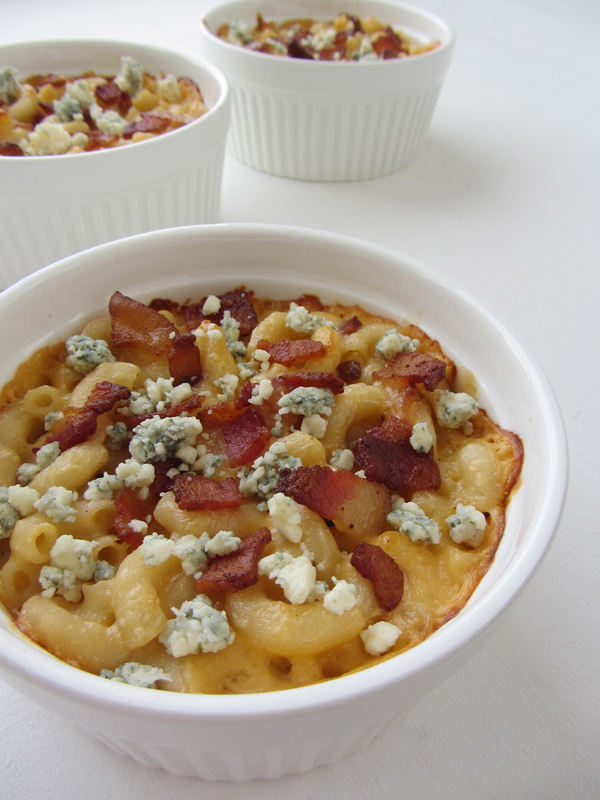 In this particular version, I have combined some of my favorite cheeses to make the sauce, with bacon added for an extra bite and boost of flavor. I hope you will enjoy it as much as I do! 1. Preheat the oven to 350F. Cut the bacon into about 1/2 inch pieces and cook in a medium sized skillet until the fat has rendered and is translucent. Transfer bacon to a plate lined with paper towel to drain off excess grease. Set aside. 2. Cook the pasta in a large pot of boiling, salted water until “al dente,” about 7 minutes. It should be firm to the bite. Drain pasta and transfer to a large bowl, set aside. 3. While the pasta is cooking, prepare a roux for the cheese sauce. In a large saucepan set over low heat, melt the butter together with the flour, and continue to cook, stirring frequently for several minutes. 4. Whisking constantly, slowly stream milk into the roux to make a smooth mixture. Stir in the cheddar and parmesan cheeses until smoothly combined. Add mixture, along with half of the bacon, to the pasta; stir to combine. Season to taste with salt and pepper. Transfer pasta into a 9 x 13 inch baking dish, or divide between 6 – 8 large ramekins. Sprinkle the remaining bacon over the top. Allow macaroni mixture to sit at room temperature until half of the cheese sauce has been absorbed. 5. Bake at 350F until edges are crisp and center is bubbling. Allow to cool before serving. Sprinkle crumbled blue cheese over the top to serve. 6. Wasn’t that easy? Now go eat! Thanks Lauren! Yes, isn’t it a great flavor combo?